Which is more than often totally overlooked. Hvar, Split, Dubrovnik and Pula are all just two-and-a-half hours away (or less!!) – which is an utter treat, especially if you’re travelling with tiny tots. 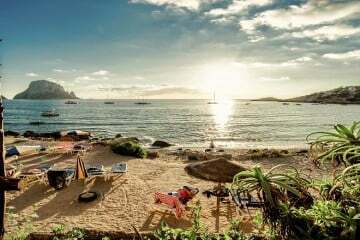 But even if you’re just jetting off with a group of friends or your other half, when you compare that to travelling to the Canaries or the majority of the Greek Islands (which are all four hours+) – Croatia triumphs in just half the flight time. I mean, need we say more? Of which there are plenty – just don’t bank for sand. Croatia is famed for its scenic pebbled beaches, which are beautifully lapped by crystal clear water. 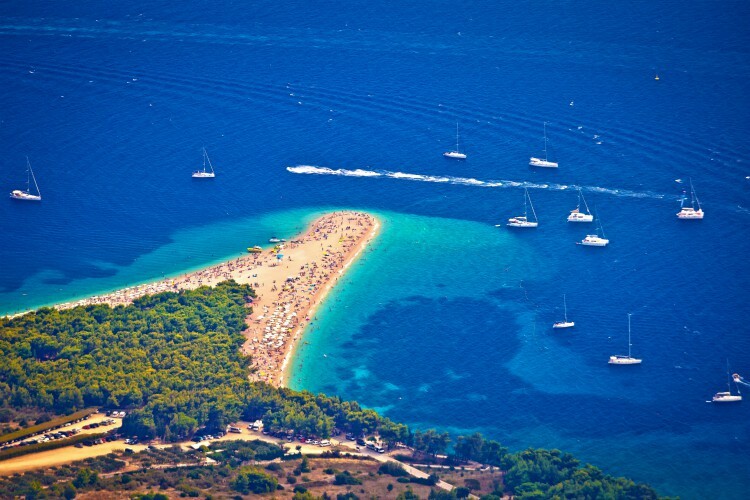 One of the most well known is Zlatni Rat, also referred to as the Golden Cape, given that the tip of the beach is ever changing its shape thanks to the elements of wind and water. It’ll then come as no surprise that the location is a protected area as well as a tourist magnet attracting visitors from all around the world. But if you’d prefer to escape the crowds, you can rent a boat from Hvar to enjoy Stiniva Bay. 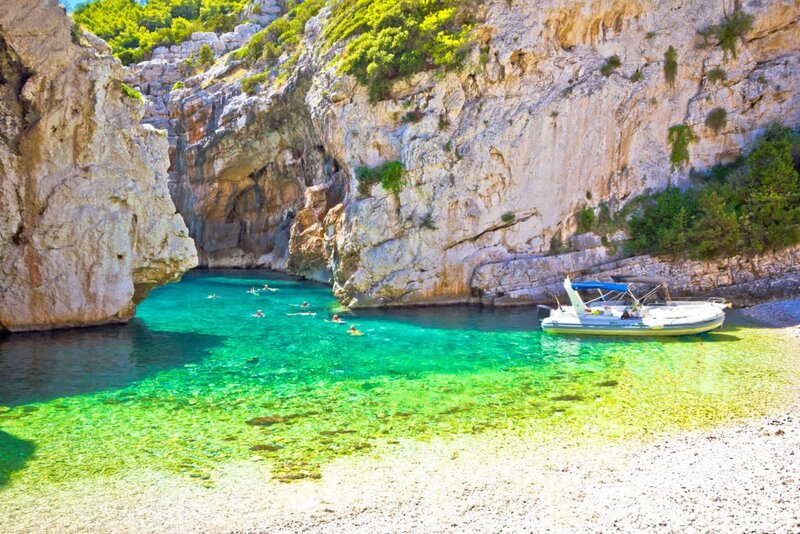 This beach is a hidden gem and only reachable by boat! Fans of the show will need no convincing! You can enjoy a full and authentic experience with the Game of Thrones tour (there’s plenty to choose from), but alternatively, you can visit your top locations and recreate pictures of your favourite scenes. It just depends on how much you want to spend, and personal preference – but the latter does sound much more entertaining. 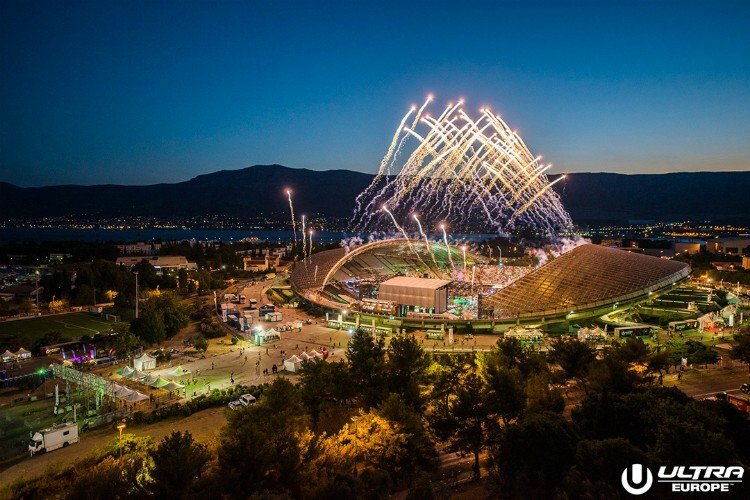 Croatia is the music mecca that has quickly become a firm favourite with festival goers. Boasting an array of world-class music festivals, you’ll be absolutely spoilt for choice. Ultra Europe, Outlook, Sonus and Fresh Island Festival are just a mere taste of the summer’s biggest draws. Most take place on the beach or somewhere secluded, so get ready to dance until you drop. Engrained since day dot, the Ancient Greeks grew wine on the islands of Dalmatia which has since been a great service to Croatians. The two main destinations to tick off are Istria and Pelješac. Although the majority of the wine is white, there are also extremely good reds to try. But besides getting your hands on a sample, you can also follow vineyard trails, go on cellar tours and meet the people behind the bottle. As an extra tip, if you see something you like, buy it directly from the producers – it’ll be considerably cheaper. It’s a win-win for wine buffs. Which is quite possibly the most important reason to visit Croatia. Utterly enchanting, the ‘Pearl of the Adriatic‘ has to be experienced, even if just once. Despite the crowds, we guarantee it will still be one of the most beautiful cities you’ll ever see. But the best way to see Dubrovnik is to get on top of the city’s walls. The walls stretch around the Old Town, a distance totalling 1.2 miles, but the view you get – let me tell you, it’s something else. From high above, you can see the damage of the war up close, all the while admiring the cities ethereal beauty. 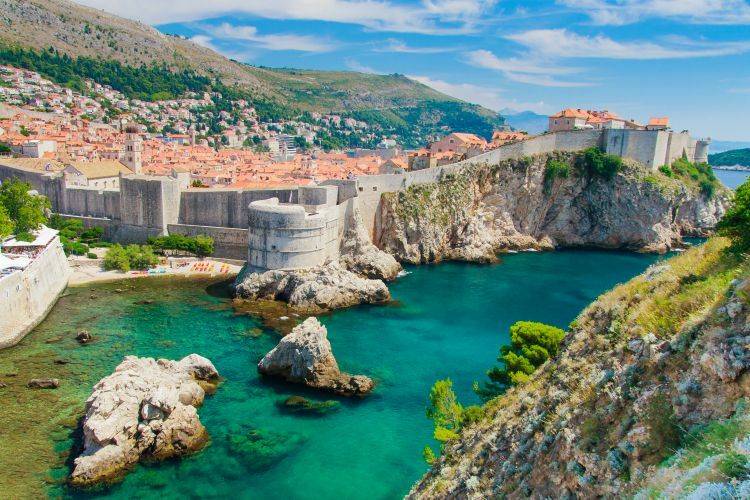 If you leave Croatia without seeing Dubrovnik, it’ll only be your loss! Is so important when you’re deciding ‘where to next’ and thankfully, Croatia won’t disappoint. But please take into consideration the time of year and the noticeable difference between the coastal and inland temperatures. The coast typically consists of a hot, dry summer, and mildly wet and windy during winter. And further inland, expect sweltering temperatures of up to 30°C in the summer and temperatures falling to below 0°C in winter. When you go is up to you, but May and September are our safe bets. And they shouldn’t be overlooked. 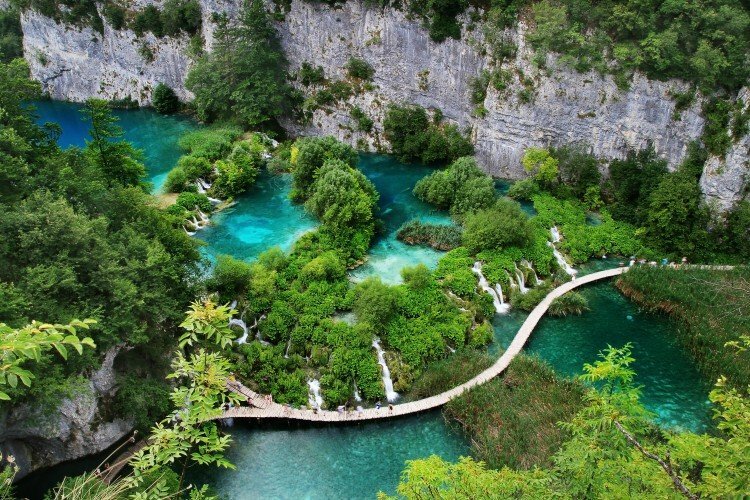 Croatia has, in fact, got 8 national parks, so you’ll have plenty of choices, but in our opinion, the one you simply cannot miss is the UNESCO-listed Plitvice Lakes National Park. As you may have guessed by the name, the park is best known for its stunning lakes and jaw-dropping waterfalls. Make sure you bring a camera because this is one backdrop you’ll want to be in front of. It’s no secret that Croatia is the ideal destination for sailors and yacht aficionados – after all, they do host an annual yacht week. So if you’ve finally decided to see what the fuss is all about it, Croatia will fully deliver and you won’t regret your decision for a single second. The boat hire is a given, but you can also hire captains to steer them – you won’t have to lift a finger. The best way to experience Croatia’s crystal clear waters is obviously to glide over them! Is plucked out of the Adriatic Sea! If that doesn’t take the cake for the definition ‘fresh fish’ I don’t know what will. From stews, oysters, and octopus (which is adored by the locals), the flavours will be nothing short of remarkable. And there’s no second-guessing that the presentation will be elegantly matched. 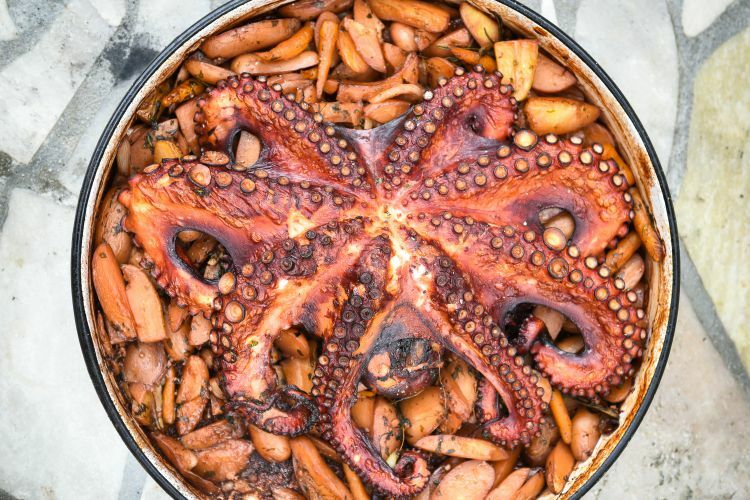 Traditional Croatian roast of octopus with potatoes onions garlic tomato and spices. If you only have the time to only visit one museum then let it be the Museum of Broken Relationships in Zagreb. Yes, you read that correctly. And for a small admission fee, you can mend your broken heart – although no guarantees on our part! The museum features objects that represent pain, love, loss – the ups and downs of relationships. Each object is accompanied by a story, but don’t worry all contributors are kept anonymous. That said, you might want to bring tissues for this one. Now that you’ve discovered the very best reasons to visit Croatia, have a look at our luxurious villas to complete the ultimate Croatian holiday package. If you need a little guidance, our concierge team will point you in the right direction!